Hamlet is one of the most melancholic and variously interpreted of Shakespeare's plays. The tragic prince, his pain, his confusion, his heartbreak and the deceits that fraught his life... it became even more wrenching as it all came from his own. The wounds on his soul were not carved by the enemy, but ones he loved. And that is the biggest tragedy of life, all of our lives when betrayed by those we trust. This is the third of Vishal Bhardwaj's adaptation of the Bard's works. Starting with Maqbool (Macbeth) and Omkara (Othello). 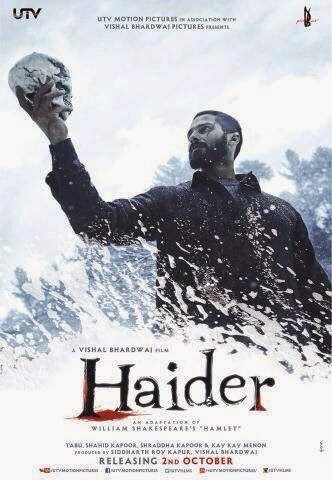 Betrayal, passion and forbidden love run through these as a theme, and the same continues in Haider (Hamlet). Considering it is a tough play to adapt and mould while adding your own interpretations and twists, Vishal Bhardwaj had taken up a mammoth challenge. To make a dark, tragic tale into something even more relevant in today's time, he picked up yet another challenge, to set the film in the Kashmir of 1995, the militancy at its peak, the Army waging an intense war against terrorism, the common man, torn by both sides, coming in the crosshairs willingly or unwillingly. Coming to the film, it has been shot mostly on locations in Kashmir. Visually it is stunning, revealing a side of Kashmir hitherto unseen. It is not the mughal gardens, the dal lake and the skiing spots. It is the everyday Kashmir, which also bore the brunt of the unrest and violence. If it is quiet and full of pathos, it is because it has been witness to tragedy. People walking without a spring in their step, pained faces and shoulders limp. VB has captured the broken spirit of the people masterfully. The film is two parallel worlds intertwined. The journey of Haider (Shahid) and the journey of Kashmir and Kashmiris. VB excels in telling the story of Haider. Shahid Kapoor, who despite being panned by many, I have always liked, his potential wasted in frivolous films in the past, but shining in films like JWM, Kaminey and now Haider, his best performance to date. He owns the character from the beginning, the emptiness in his eyes as he returns to Srinagar from Aligarh, after hearing about his father's disappearance. The quiet storm raging inside him as he watches his mother flirt with his uncle, the mad glint in his eyes as his whole world falls apart. He has proven that in the hands of a fine director, he will shine. Kay Kay as Khurram, the conniving uncle, is back in form. He enjoys every scene, relishing each line, staying just a little longer in places, but he plays Claudius well. Shraddha Kapoor as Arshiya (Ophelia) brings in warmth and light to the dark tale, the girl has still a long way to go as a performer, but in Haider, her charm works, her wide mouthed laughter is a great foil to Haider's brooding looks. It is good to see Lalit Parimoo on the big screen, as the gray shaded father of Arshiya, who is against their love, he is adept. What delighted me was a cameo by Kulbhushan Kharbanda, whose track was opened and then forgotten all in a hurry. Another gem of a cameo is that of Irrfan Khan, he plays the "Ghost" inspired Roohdar, enjoying himself in this short but powerful part. The other supporting actors are extremely well cast too. Sumit Kaul and Rajat Bhagat as the Salmans are delightful, the grave-diggers are ominous yet playful, Narendra Jha as Haider's father (King Hamlet) does a decent job, though I found his presence not so powerful. And now coming to the scene-stealer, Tabu. Her Gazala (Gertrude), Haider's mother, is breathtaking. Those eyes! 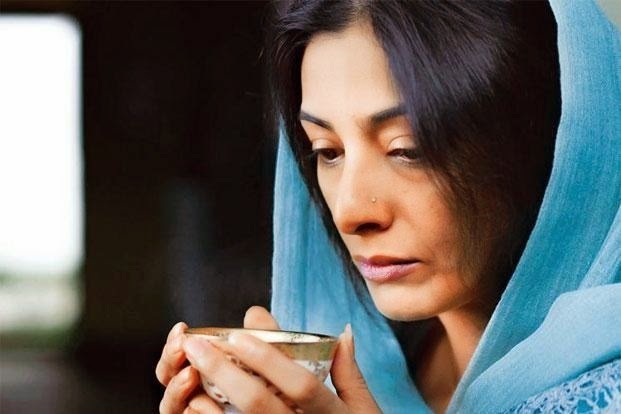 they speak, smile, cry, bemoan, quiver, shine, scold, beg, love.... We have seen Tabu in Maqbool as Nimmi (Lady Macbeth) which was her finest performance, Haider's Gazala gives it a tough competition. Her character of a woman who loves her son, to death... a wife who has not been a perfect partner, divided between multiple shades... She owns the film. Shahid's fire to excel and Tabu's honing of her own craft, crackle the screen when they are together. The story of a son's mission to find his missing father and dealing with life's tragic twists, Haider will move you to a realm that is dark and depressing, yet satisfying. The end is Vishal's own, which works. The co-writer on the film is the renowned Kashmiri Journalist Basharat Peer, whose real life experiences have helped create the world of Haider and the Kashmir we see in the film. The dialogues by Vishal Bhardwaj are memorable, sharp, witty and soulful, a rarity these days. Coming to the Kashmir VB has created. The life without cheer, every day spent in fear, curfews and bullets, the paradise lost. I liked the gloom and the injustice of the situation, the futility of hatred, the sad phenomenon of "Half Widows", wives of the thousands who have disappeared... never to be found... But yes, I found the representation of "Kashmiris" almost myopic. The portrayal has conveniently forgotten the large chunk of Kashmiris who are the Pandits, displaced from their land, their homes, their livelihood lost. A passing reference cannot be enough when you are talking of 1995, when chaos reigned supreme in every single Kashmiris life. The beauty of Kashmir also stemmed from the love and harmony of its people, which was the first casualty of terrorism. The take on Terror itself is unclear. So about the Kashmir of the film I have questions, which were not answered . Yes it is a fictional recreation and liberties can be taken, but then why even put a slate in the end applauding the efforts of the Army in the recent flood rescue and rehabilitation? When in the film the Army is actually shown in less than complimentary light. Having said that, Haider is an important film, on many levels. The unflinching storytelling, raising the difficult questions our cinema today shies away from, bringing Kashmir to the forefront and above all, giving us a film that stays with you long after you have watched it, in the times of popcorn cinema, which leaves you empty, just like the popcorn tub after you are done. The subtle exploring of the Oedipus complex, with Tabu just killing it with her trembling hands and brimming eyes... aah, that itself was worth my ticket price. The music by Bhardwaj and poetry by Gulzar adds a lilting layer. I do wish the length had been a bit less, but well, that indulgence I shall allow. The production design of the film is another trump card, from the shawls, namdas, pottery to the locations, it is perfect. Kudos to Vishal Bhardwaj and his entire team.